I hope your wallet is infinite too. Disney owns many franchises, and in it's deep vault of characters and imaginary worlds; there's guaranteed to be one you're attached to. 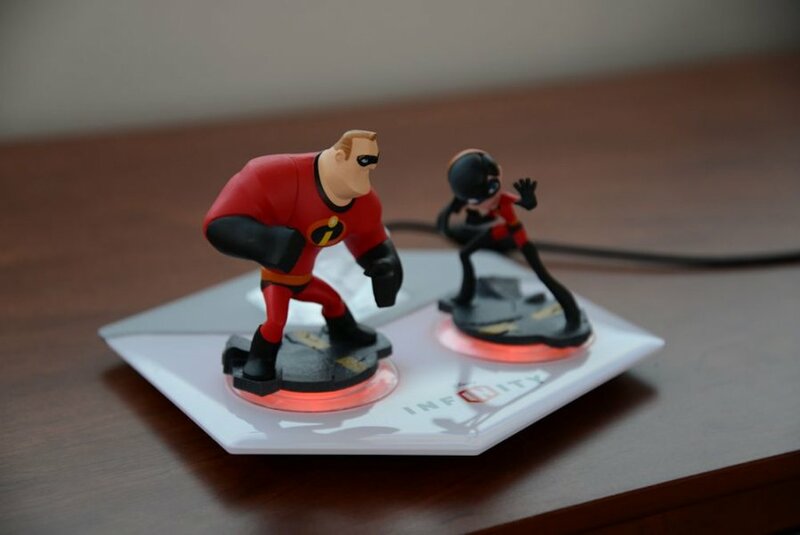 From classic characters like Mickey Mouse to modern newcomers like the Incredibles, whatever world your favorite Disney character lives in is most likely represented in their new game Disney Infinity. The game combines physical collectible figures with a videogame to create a hybrid collectible adventure title that will entice your children, or perhaps, your inner child. When talking about the figures of Disney Infinity, it's hard to not bring up Activision's Skylanders, another collectible videogame hybrid which pioneered this style of gameplay. Players purchase physical figures and place them on a portal which then magically creates them in the game. It's store bought "DLC" and it's a sneaky way to get people to buy stuff that's already included with their game. At launch Disney Infinity has 13 figures available to load into your game. These include characters from Monsters University, The Incredibles, Cars 2, and Pirates of the Caribbean. This is merely the first wave of characters in what's planned to be many releases. The next batch of characters are coming in October with over 20 additional characters planned. This includes franchises such as Toy Story, Wreck-it Ralph, Phineas and Ferb, Nightmare Before Christmas, Frozen, and Tangled. Individual figure costs $12.99 and there are double and triple packs available for some at varying prices. The figures themselves are very detailed, solidly built, and look good. Collectors won't mind displaying them on their shelves while kids will enjoy "playing" with them without too much risk of damage depending on the figure. Some contain some pretty thin limbs, but most are rock solid. The figures actually store information about the character from the game, which means you can collect items and levels for your Mr. Incredible and then bring it to a friend's house and share that content. Out of the box Disney Infinity gets you rolling with three figures, a portal, and three playsets (which are physical crystals you place on the portal). Playsets are your story based worlds - worlds in which ONLY those characters from the universe are allowed to be in. This means no bringing Mike from Monsters University into Pirates of the Caribbean. There's a big problem with this for co-op gamers, it means immediately you are required to spend money to play any of the playsets in co-op. 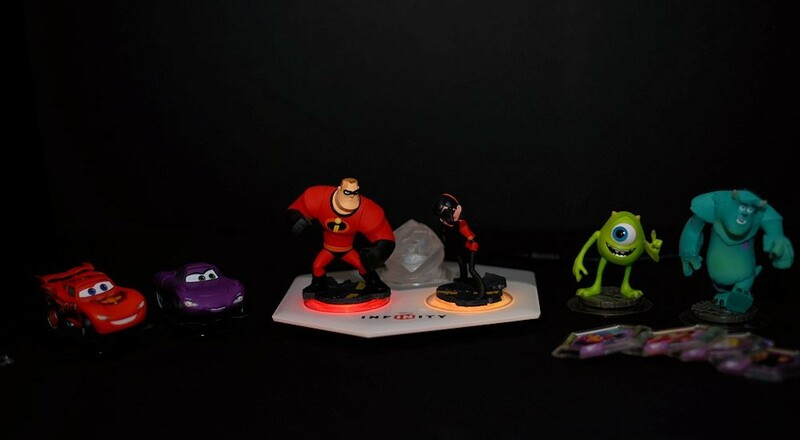 Disney Infinity is really a few types of games rolled into one all launched from a hub world. The hub world has random monster spawns, items to pick up, and other places to travel. One of these sections is called The ToyBox, and is a bit of Minecraft mixed with Little Big Planet. It allows any characters to join together and roam an open world. and you can build and create your own stuff to do. To do this you're given access to a collection of objects and customizations you've unlocked from all the game's modes of play. For example you can create an entire soccer stadium with working goals, soccer ball, a crowd, and "play" soccer. There are track pieces to be found as well so you can build a racetrack to use your vehicles on too. All in all it seems fairly open, but simplistic, as to what you can create in the ToyBox mode. There's no overall goal here, other than creating something cool and then, if you want, sharing it with the world. Page created in 0.3727 seconds.